If you’re watching this video, there’s a good chance you’ve been diagnosed with Polycystic Ovarian Syndrome, or you know somebody who has it. I want to talk about the mental, emotional and physical side of things and how we can actually reverse this condition. First and foremost, mentally and emotionally, the ovaries and anything to do with the reproductive system typically has to do with our creativity. If you think of the ovaries and the womb as where creation is done, energetically it’s connected to our own creativity. I have a belief that a lot of physical manifestation of disease has everything to do with what’s actually going on in our life. The answer is typically, “Yes, I used to be very creative but life came along and I just had to work and take care of the kids and didn’t have time to be creative anymore”. From that mental and emotional side, it’s about expression. If you can express yourself more and be more creative, it will help you physically. This doesn’t have to be painting or drawing, but can include things like decorating the house, being creative in your space, creative with music, creative with whatever you are inspired by. When you are in your creative flow, it’s going to create some healing inside your body. The physical side of things is very much a hormone imbalance. I believe this hormone imbalance happens because of your lifestyle, and specifically your diet (what you’re actually eating). Bad food creates an acidic condition inside the body. You’re throwing the hormones off and end up getting these polycystic ovaries. I’ve worked with so many clients who have had PCOS, and they had complete success reversing this without hormones, drugs or medical treatments. I’m going to tell you exactly what they did so you can do it too. First, they cleaned out their system by doing a Four Day Colon Cleanse, which is basically eating some fiber and cleaning out the digestive system so that the body can eliminate toxins. After their Colon Cleanse, they went right into what’s called a Cabala juice fast. Cabala stands for carrot, apple, beet, apple, lemon, and apple. The reason there’s three different apples in there is for red, yellow and green apples. 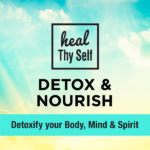 I have the recipe in a free group called the Detox and Nourish Group where you can learn all about juice recipes and fasting and all the things that you need to do to heal yourself. But I can honestly say, every woman with Polycystic Ovarian Syndrome who did a colon cleanse and 21 days on CABALA juice completely reversed the condition. Now, obviously you need to modify your lifestyle after that and continue to drink juices and eat plenty of fruits, vegetables and wholefoods, and stay away from processed junk. If you think you need a little more support for a fast, I have a program called Heal Thy Self Fast. I run this program in Bali where we can all get out in the sun and build Vitamin D (which also corrects hormones), where we make all of the organic juices for you and you’re supported by a whole team of individuals who help you to go into a deep state of cleansing. Mentally and emotionally you’ll be clearing out a lot of stress and past trauma that will really bring you up to a place energetically where you’re healed mentally, emotionally, physically, spiritually. If that sounds like something you’re interested in, I would highly recommend checking out the Heal Thy Self Fast. I only run it a couple times of year, and it is an absolutely transformational program. Otherwise, if you want to do it at home, I’ve just given you the answer. Go to the Detox and Nourish Group and learn all the different cleansing activities and tools you can do while you’re on this CABALA juice fast. It really does work. Just get into it. Heal yourself so you can move forward with longevity, health and vitality.